Outstanding features abound in the Rejuvenator Portable Sauna. It includes a built-in auto shut-off safety feature, durable moisture resistant satin polyester material, and energy efficient low EMF carbon fibre infrared heater panels. This fully insulated unit features triple layer rich-looking satin polyester exterior fabric, cotton insulation and a durable reflective polyester inside material - lock stitched together for superior panel strength. The pre-attached EZ fit solid Beech hardwood dowel frame support system and the quick-set portable chair with oxford canvas fabric means setup is quick and easy. No tools needed. Completely portable, easily folds up for storage or traveling. It is intended for relaxation and recreational purposes. 1 year limited warranty. Our 5-piece Deluxe Sauna Accessory Kit was designed for comfort, convenience and functionality. Each piece is constructed from top-grade western Canadian Hemlock wood, sanded to an ultra-smooth finish, and ready for use. This kit includes a head rest, back rest, leg rest, magazine rack, and a combination drink/robe/towel holder. The ergonomically designed headrest, backrest and leg rest conforms to the curves of your body providing added support and comfort, The magazine rack and drink/robe/towel holder keep your reading materials, drinks, robes and towels within reach. Installation is easy - all necessary hardware is included. This is a great way to add additional comfort and convenience to your sauna, enhancing your overall experience. 1-Person Hemlock Infrared Sauna with 3 Ceramic Heaters Radiant Saunas are the safe, effective and affordable way to relieve stress and improve health, right in the comfort of your own home. Radiant saunas utilize the latest in infrared heat technology and are super easy to assemble. With their Solid Hemlock Wood and tongue & grove buckle construction, these saunas are built to last, providing you with years of health benefits and stress relief. The 1-Person Infrared Sauna is perfect for relaxing and rejuvenating and will fit in virtually any room in the house. The dual interior and exterior LED control panels allow for easy temperature control. This sauna comes equipped with a magazine rack, backrest and a CD Player with mp3 plug-in! This Sauna operates on a safe 120v/15-amp power and is backed by CETL certification. 5-Year Warranty on wood, structure, heating elements & electrical; 1-Year Warranty on radio. 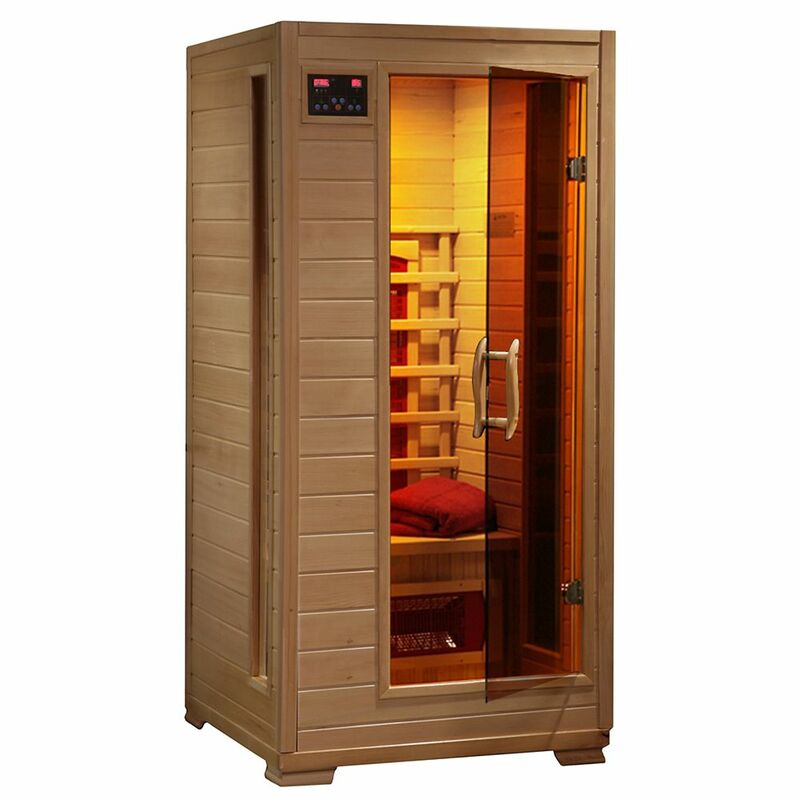 1-Person Hemlock Infrared Sauna with 3 Ceramic Heaters is rated 4.4 out of 5 by 8. Rated 5 out of 5 by HomeDepotCustomer from Overall it was everything I could have expected it to... Overall it was everything I could have expected it to be!Very easy to assemble! Rated 4 out of 5 by DavidG from Sauna works great. Some of the labeling of parts... Sauna works great. Some of the labeling of parts could have been slightly better but assembly was relatively easy. Only reason for 4 instead of 5 stars is that there was no remote for the radio as listed and the clock on the radio gains about an hour a day of time. Probably a voltage issue. Rated 4 out of 5 by BigAl from Easy to put together, 2 man job. Easy to put together, 2 man job. Rated 5 out of 5 by Victoria from Very easy to put together. Compact size for our small space. Heats pretty quickly and is comfor... Very easy to put together. Compact size for our small space. Heats pretty quickly and is comfortable. The slight wood scent is not at all overpowering and enhances the sauna experience. Rated 5 out of 5 by Buddy from Sauna was extremely easy to assemble, took about 30 minutes with help from one other person. I... Sauna was extremely easy to assemble, took about 30 minutes with help from one other person. I have used it almost every day. It really does re-invigorate you and also aids in helping remove lactic acid build up from a vigorous workout! Rated 4 out of 5 by Anonymous from Hot Husband! Got this as a gift for my husband. He loves the dry heat of a sauna. Says it helps his fibromyalgia especially now that the weather has turned so cold. He enjoys it several times a week. He really likes the radio, which is a plus.